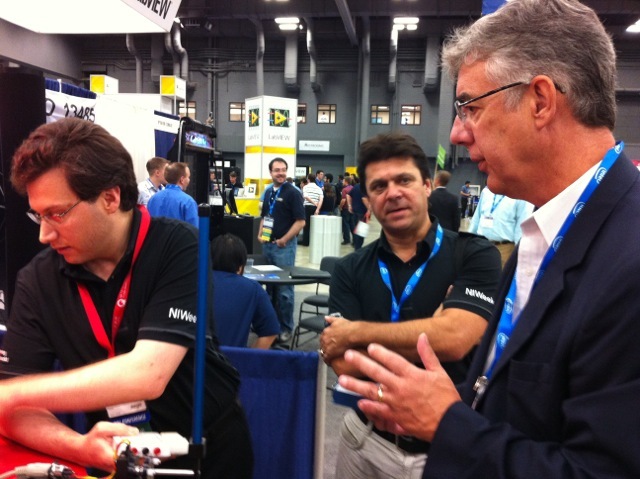 Every year, National Instruments (NI) call upon the engineers of the world to gather and celebrate the achievements and potential of engineering, and to honor and perpetuate nerd culture, and to do justice to the folksy mantra, “Keep Austin Weird!” This annual phenomenon is, of course, NI Week. Quanser has been a long time strategic partner of NI and this year, with no exaggeration, our experience at NI Week 2012 held in August, was the best ever. Unlike the more scholarly engineering conferences, NI Week is unabashedly festive in tone. Yes, there are plenty of technical sessions where attendees get updates on the latest esoteric tips and tricks on data acquisition. But the true highlights of the conference often erupt during the plenary sessions or even on the exhibits floor. There people have a chance to congregate and channel their “inner Thomas Edison” in a single location. Quite often, magic seems to happen. Control visionary Dr. Mark Spong drops by the Quanser Booth during NIWEEK 2012. This year we showcased several important milestones. 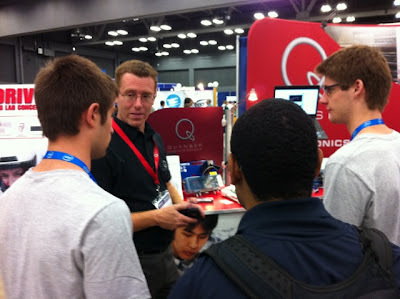 The most strategic was the announcement and demonstration of two new exciting products: the Quanser Q1-cRIO DAQ module for the NI Compact RIO platform, and the Quanser Rapid Control Prototyping (RCP) Toolkit software for LabVIEW™. Collectively these products streamline the deployment of even the most ambitious control systems application a lot easier. In their respective ways, these two new products take care of a lot of the cumbersome wiring and I/O software housekeeping that curse most users. cRIO and LabVIEW have always been excellent tools for a wide range of control systems work but the Q1-cRIO and RCP Toolkit make the NI platform truly complete. 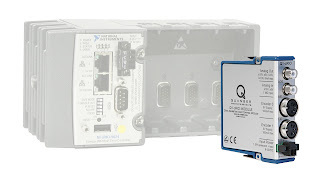 In many ways, the combination of NI’s traditional DAQ and instrumentation product line and Quanser’s control-centric product line collectively comprise a market-leading, end-to-end solution for modern control systems education and research. Above: a closed loop controller developed with the Quanser RCP Toolkit. helps students grasp concepts better. As important and strategic as these product launches were, the real fun was our presentation of the Quanser Driving Simulator (QDS). We debuted this innovative approach to undergrad control lab experiences earlier this year at the ASEE conference. We reprised this concept as part of the NI Week Academic Forum “sub-conference”. 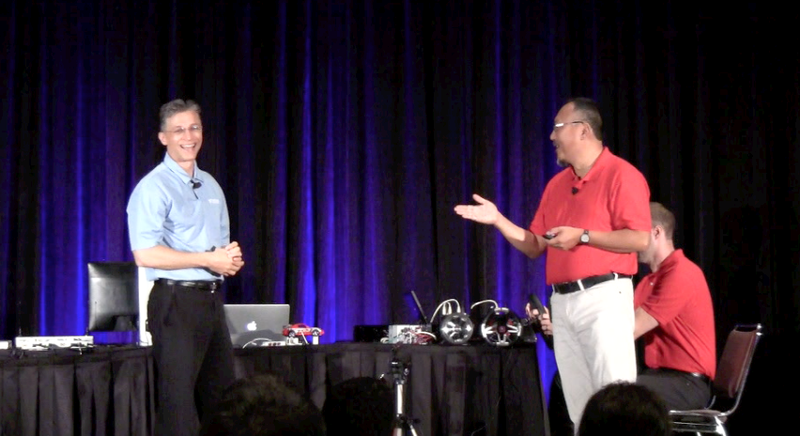 Additionally, we were invited to present and demonstrate QDS as part of the keynote presentation for the Academic Forum. The tech conference keynote … we’ve all seen iconic footage of Steve Jobs or Bill Gates standing atop a big stage, and with great fanfare, usher in a new vision of one thing or another with huge hyperbolic promises and a jaw-dropping demo. I wasn’t exactly Steve or Bill unfortunately… I look terrible in a turtleneck, and our demo actually worked… but it’s about as close to that as I have ever been. Ably assisted by Quanser “demo jock” Peter Martin, we did our best techno-samba on stage. Dave Wilson, NI’s Director of Academic Programs and the principal speaker for the keynote, proclaimed “We nailed it!”. Translation: all the demos worked, all the key points were made, the audience laughed at the jokes, even the bad ones, and most importantly, the audience got it. NI President, CEO and Co-founder Dr. James Truchard experiences the Quanser Driving Simulator for himself. Next to him is Quanser Chief Technology Officer and Founder Dr. Jacob Apkarian. The Quanser message was in many ways a profound statement of what can be done in education with some cleverness and the right tools. The QDS pedagogy introduces a dynamic, motivating application layer persistently through all of the labs in a given course sequence. In this sense, it’s easier for students to relate abstract concepts to the real world and to connect ideas to each other. As an added bonus, the QDS introduces students to the critically important techniques of Hardware-in-the-Loop (HIL) testing, which have revolutionized modern advanced industry. Unfortunately, as important as HIL is, the conventional curriculum has yet to reconcile the new with the old. QDS offers an efficient path to achieving this. 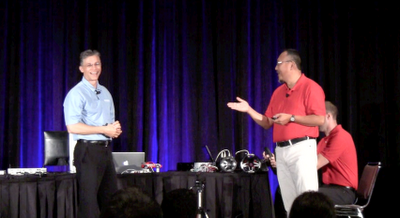 In 2009, while I was still with Maplesoft, I had the pleasure to be on stage in Austin (ASEE was held there that year), with the then-young Keith Blanchet, Quanser’s Director of Business Development. That was the first time that I had collaborated on a presentation with this weird company called Quanser. You can read the account here. with his technological and educational wisdom. That collaboration actually triggered my interest and eventual explorations into the complex relationships between the physical world and the theoretical world and this exploration lead me to my current job—and back to Austin. If you read between the lines of my previous post, there was a very strong “prescriptive” dimension, i.e., if we do this, the world would be better. Fast forward to last week, when I got the real sense that my words on stage this time around were fundamentally “descriptive”, i.e., we HAVE achieved this and we can see the changes happening. I’ve been and continue to be very impressed with Quanser and its vision and focus on wildly imaginative yet practical ways to enrich modern education.